Back cover blurb: Evan is a nurse, a suicide assistant. His job is legal – just. He’s the one at the hospital who hands out the last drink to those who ask for it. Evan’s friends don’t know what he does during the day. His mother, Viv, doesn’t know what he’s up to at night. And his supervisor suspects there may be trouble ahead. As he helps one patient after another die, Evan pushes against the limits of the law – and his own morality. And with Viv increasingly unwell, his love life complicated, to say the least, Evan begins to wonder who might be there for him, when the time comes . . . The Easy Way Out is a very different novel... one that I suspect may not be to everyone's tastes. Evan is a nurse, a good nurse, who really cares about his patients. But his latest department and role is not exactly conventional. Simply put, Evan helps his patients to die. Assisted suicide is a difficult and emotive subject to write about, and I imagine a difficult subject for some to read about. At a cross roads in his life, Evan, single and Gay has recently moved back in with his Mother who needs him to help care for her. Of course life (or death) is never as simple as we would wish it to be and Evan must face challenges in his life both personally and in his career. 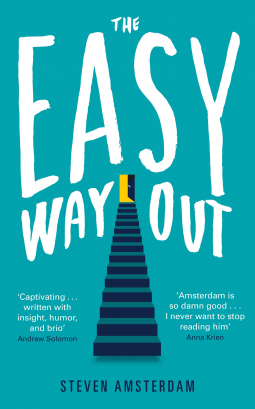 The Easy Way Out is a touching, funny and at times heart warming novel about the most unlikely of subjects. The Easy Way Out is available now via Amazon online and all good shops.